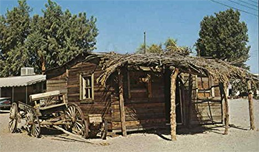 Earp and nearby Vidal have the distinction of being the southeasternmost communities in San Bernardino County as well as lying within the Sonoran Desert, close to the California/Arizona state line at the Colorado River in Parker Valley. The majority of 20,105-square mile San Bernardino County falls within the Mojave Desert. Earp’s location within the Sonoran Desert is therefore noteworthy. The town was originally named Drennan. In 1906, the famed Old West lawman Wyatt Earp and his common-law wife, Josephine Sarah Marcus, began living there part-time, particularly during the winter. The couple would return to Los Angeles for nine or ten months out of the year, but while in Earp, or Drennan as it was then known, Wyatt Earp staked more than 100 copper and gold mining claims he collectively referred to as the “Happy Days” mines near the base of the Whipple Mountains. The town was never incorporated. The post office near Earp’s mining claims at the eastern terminus of Highway 62 near Parker, Arizona was redesignated “Wyatt Earp, California” after Earp’s death in 1930. It now bears the ZIP code of 92242. Today the town is simply known as Earp. There are some 1,500 residents living within the town and its vicinity. At 233 miles from San Bernardino, Earp lays claim to having a post office further away from the county seat than any other town in the U.S.